Both types of tractors cut grass, but that's where the similarities end. The decision is actually about all the other chores around your yard. 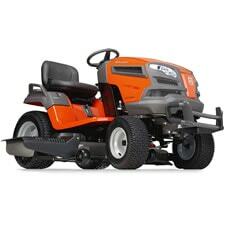 If you're primarily looking to cut grass and perform light yard work, a lawn tractor will serve you well. If you also want to use your tractor for heavy-duty, earth-moving chores like tilling and cultivating, you'll want to step up to a garden tractor. Lawn tractors are lighter duty than garden tractors, featuring lower torque transmissions, less horsepower, and smaller rear tires. For added traction and stability on uneven terrain, you should look for a lawn tractor with locking rear differential. While you won't have the same forward speed, the stability you gain on slopes will be well appreciated. Garden tractors are like a beefed-up version of a lawn tractor, capable of more heavy-duty ground engaging jobs. They're capable of tilling, furrowing, towing heavier cart loads, and even plowing dirt and snow. Garden tractors all have at least 24 horsepower engines, capable of towing heavy-duty attachments. They also include larger back tires for extra ground clearance. These larger wheels also provide enhanced stability on slopes and inclines. However, if you're using it on slopes greater than 15%, you should consider a tractor with a traction control system or locking rear differential. Whether you choose a lawn tractor or a garden tractor, you'll have to decide what you want to do with your clippings after you mow your grass. Tractors give you two options for disposing of your trimmings. Mulching kits come in a variety of sizes. Compatibility is the key. Just make sure your kit is the same size and brand as your tractor. Baggers come in either double-bag or triple-bag styles, depending on the tractor size. Stick with the same brand to ensure compatibility. 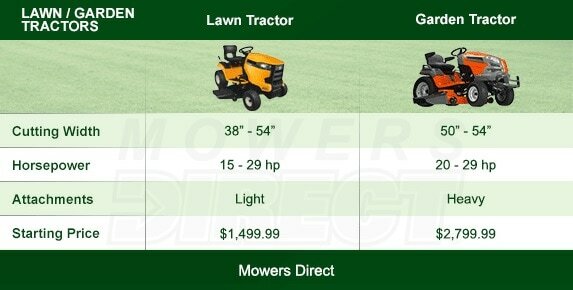 Lawn and Garden Tractor Buyer's Guide - Find Out How to Pick the Perfect Lawn & Garden Tractor. Our lawn mower how-to library can help you pick the perfect reel lawn mower, push lawn mower, riding lawn mower, zero turn lawn mower, lawn tool or lawn mower accessory.